Trust is just as important online as it is offline. That’s why many people use website rating reputation tools to check out websites, links and files before they decide to interact with them. Website owners can also use these tools to check the rating of their own sites to identify if they have a potential problem with how their site is rated by users or search engines. Secondly sites can leverage user generated content via customer ratings and reviews to display customer feedback on adverts and on your website. This can help build your brand reputation and improve your conversion rate. However, let’s first look at website reputation checkers which many people rely on to check if they can trust a website. These tools are designed to protect your online browsing from malicious websites that can attempt to steal data or infect your device. Many of the tools are backed by professional security software companies and allow users to surf without having to worry about security. The browser extensions are often free and give users an additional level of security when browsing. Real-time scanning of links you click on. Scanning of links on search engine results pages (SERPs). Real-time scanning of web based threats when you click on a link. 2. McAfee WebAdvisor: One of the most popular website rating tools which blocks malware and phishing sites if a user clicks on a malicious link by mistake. It protects users if they mistype a web address and helps direct them towards the correct site. Download protection scans downloads and alerts users if there is a known risk. Finally, security check notifies users if their firewall and antivirus are activated before they surf. 3. MxToolbox: A free website rating reputational lookup tool that will check the domain or URL for phishing and malware issues against the Google Safe Browsing and Phishing Tank lists. It also checks if the domain or URL is suspected of containing malicious code, harmful programmes or is considered to be a phishing site. 4. Norton Safe Web: A free website rating tool developed by Symantec Corporation which identifies malicious websites. Safe Web provides information on websites based upon automated analysis and user feedback. 5. Talos Intelligence: A free website reputation checker site that allows you to search by IP, domain or network owner for real-time threat data. The Talos IP and Domain Reputation Center claims to be the world’s most comprehensive real-time threat detection network. 6. TrendMicro: This a free website reputation checker which scores websites based upon factors including the site’s age, historical locations, changes and indications of suspicious behaviour identified through malware behaviour analysis. The tool is adept at keeping pace with new types of criminal attacks that appear and then go very quickly or try to stay hidden. 7.Virus Total: A free website reputation rating tool which runs a file or domain name against several dozen search engines at once and so provides an overall detection rating. Virus Total’s main strength is that it receives around one million submissions a day and so new problem files and domains should be identified very quickly. 8.URL Void: A free website reputation rating service which analyses domain names through multiple blacklist engines and online reputation tools to detect fraudulent and malicious websites. 9. Webroot BrightCloud: A free website rating tool from Webroot which offers web classification and reputation rating, IP reputation, real-time anti-phishing, streaming malware detection, file reputation checking, mobile security SDK and mobile app reputation checking. 10. Web of Trust (WOT): This is a free Chrome extension for a secure browsing environment which displays a website security icon next to every URL and reputation alerts for suspicious sites. The tool relies on user generated trust and reputation and users can rate a site on reliability, privacy, child safety and overall trustworthiness. Customer review software is important because research shows that customer recommendations drive 20% to 50% of all purchasing decisions. 87% of people trust online ratings and reviews when it comes to deciding which local service they will use. 92% of internet users read online ratings and reviews for local businesses. Customer review software improves your visibility in search engines and social media and increase click-through rates. Online word of mouth or user generated content can be a powerful influence on visitor behaviour. Due to our social nature people are heavily influenced by the behaviour and opinions of others. This is why indicators of social proof, such as testimonials and product ratings and reviews can be so persuasive on websites. Customer review software therefore facilitates social sharing and influencer marketing. People use social proof as an indication of how trustworthy a website or app might be. If a site appears popular and has good ratings and reviews it provides reassurance to visitors that it is likely to be a genuine and trustworthy site. Customer review software helps to automate this process and can deliver a good return on investment through increased sales. When there are no rating and reviews visible on a site this can raise anxiety in the minds of users. Why are there no reviews? Is this a genuine site as there are no customer ratings and reviews? Customer review software has become so well established on major sites like Amazon and AO.com that the absence of such software can cause concern among website visitors. People also know that a site with a good reputation is less likely to sell faulty or sub-standard goods or services because they might damage their brand reputation if they did so. Customer ratings and reviews are especially influential when we are faced with uncertainty, such as when buying something for the first time. This is why displaying ratings and reviews using customer review software can be so powerful. A large number of ratings and reviews can help build trust and credibility of your site and provides guidance for customers on which products people are most satisfied with. This helps to reduce anxiety about your site and the suitability of the products you sell. Our recommendation for a customer review software is Trustist Reviewer as this is an innovative, but competitively priced solution which has been developed by people who have previously worked in e-commerce. They understand how users respond to reviews and the challenges faced by marketers to effectively use product ratings and reviews. For other other free and subscription digital marketing solutions see my free digital marketing toolbox. Here are ten of the most popular e-commerce customer review software platforms to help build trust and credibility on your site. 1. TRUSTist REVIEWer: – Recommended! A new but innovative approach to customer rating and reviews plaforms. 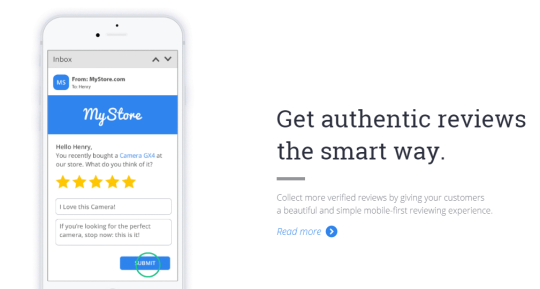 TRUSTist will set up and aggregate existing reviews and customer testimonials from the web and social media to immediately get stars in your search results. The simple copy and paste code snippet integration means that all maintenance, including making changes to respond to policy updates from Google, is handled by TRUSTist. You will also get stars in your natural search results for your website (not on their site). This will generate more traffic and higher click through rate. TRUSTist will provide you with a platform to collect on-going reviews using email and your websites. This helps keep the content current and will provide SEO benefits. No costs are shown on the site, but I understand they are highly competitive and it is well worth getting a quote for comparison purposes. It is ideal for large and small e-commerce retailers. Conversations encourages customers to review products, ask questions, give answers and share stories. Connections manages responses to shopper questions & reviews across their network of retail sites. Local makes authentic customer reviews available on your website and on the sites of local providers that carry your brand. Curations pull authentic, moderated social media content into your buying experience by displaying it on your website. Media engages active shoppers online and in-store via their ad targeting technology. 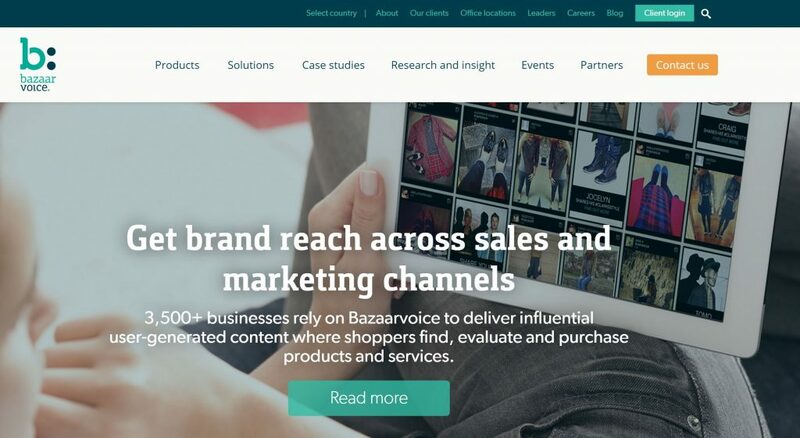 Bazaarvoice claim their clients see an average 65% lift in revenue per visit and 52% uplift in conversion on product pages with ratings and reviews. They also see a 98% average conversion uplift when shoppers engage in Q&A on major retail sites. Has over 3,500 clients. A customer ratings and reviews software solution that provides qualified reviews from real customers who have made a purchase from your organisation. Every review can be shared across social platforms and with the Feefo Facebook app you can automatically position reviews into the heart of your social engagement strategy. As a Google Licensed Content Partner, Feefo submits ratings and reviews on behalf of merchants to be included in to Google’s listings. Offers a Free trial period to try out the service. Provides a consumer engagements engine for over 1,000 brands to collect customer reviews and answer questions from consumers. The consumer engagement engine powers ratings and reviews and Q&A solutions that have resulted in more than 22 million reviews. Their syndication network distributes reviews to all major retailers and search engines. Measures social traffic, engagement and content generation and determine how they drive traffic, conversion and sales. Provides strategy, implementation, moderation and management services to ensure best practices are established. A single platform for company, product and in-store customer ratings and reviews. Product and merchant reviews to increase trust online. Retain control of the process via real-time moderation, reply function and customisable review request emails. 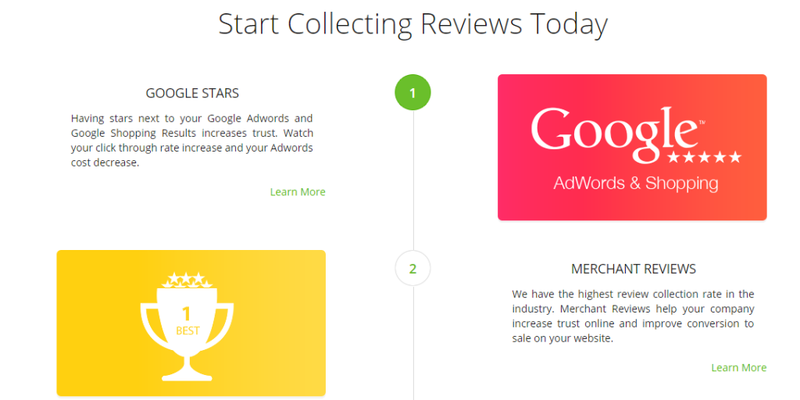 Review booster – delivers star ratings in Google by contacting previous customers to obtain a boost in the amount of reviews you collect. Social integration – links up to your Twitter account so that you are constantly updating fresh content. Every time you recieve a 4 or 5 star rating it will update your Twitter feed. Their iOS & Android app allows you to manage and receive email alerts shortly after a customers leaves a 1 or 2 star review to provide the opportunity for an immediate response. Has over 3,000 customers using their platform. The system is available in English, French, German, Spanish and Japanese. Free 30 day trial available. TrustFreaksdata is the business solution to TrustFreaks.com which is a Swedish-based ratings and reviews platform that allows organisations to proactively collect customer reviews. Seller reviews are also collected and moderated by TrustFreaks to ensure impartiality in maintained. The platform allows you to instantly achieve critical mass for product rating and reviews as TrustFreaks aggregates thousands of expert and consumer review sources and will match them to your product feed. Their question and answer feature allows site visitors to post questions and receive answers directly from your customer support team. TrustFreaks is used by online retailers in over 30 countries. Trustpilot is a community-driven customer review platform from Denmark, but is now established in over 60 countries, including the UK and U.S. The software allows organisations to proactively collect both product and seller reviews from customers. 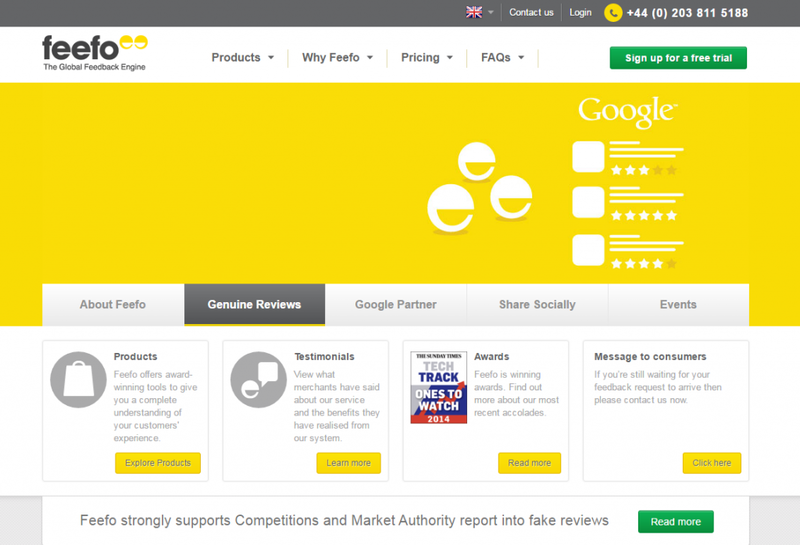 In the UK the e-commerce retailer AO.com extensively uses Trustpilot reviews on its whole site, including on category and product pages. 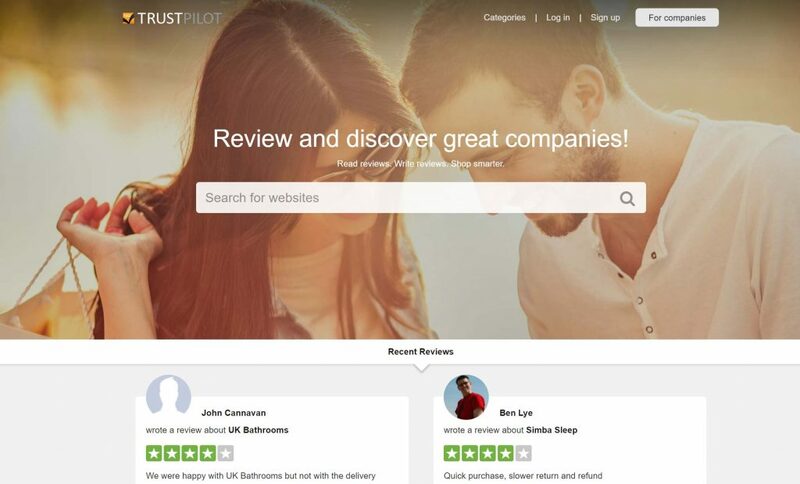 Trustpilot offer a free basic version to create a profile page and collect customer reviews. The subscription service allows you to create customisable review invitations, share content on social media and integrate the platform with your internal business systems. Trustpilot collects 20,000 new reviews each day or over 750,000 each month. It has a total database of over 26 million reviews of 152,000 businesses and counting. I’ve read some mixed reviews on Trustpilot if your site doesn’t have a high volume of visitors. The service costs from around £10,000 a year and so calculate your likely response rate to ensure it is value for money. 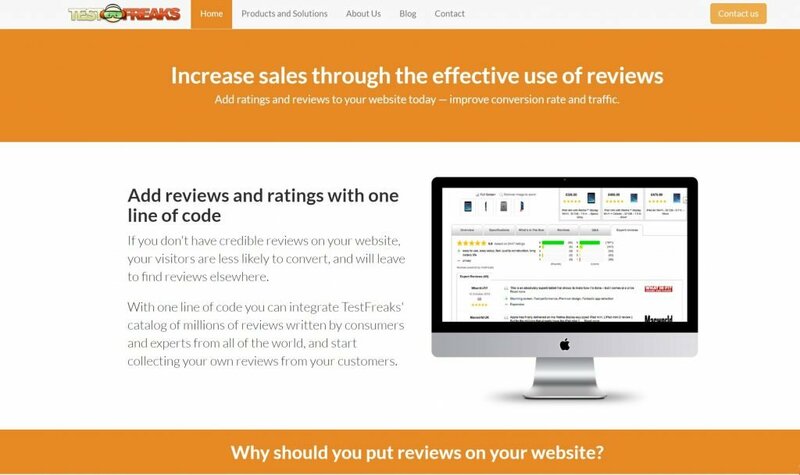 Customer ratings and reviews software that captures four types of user generated content; ratings and reviews, community questions & answers, visual reviews (phone-based capture) and micro-reviews at point-of-sale. The platform integrates with your business systems to deliver a personalised user experience that captures more content than most other review software on the market. Review generation – Delivers automated, fully-customisable and mobile responsive emails after purchase which includes upsells in all review request to increase lifetime value. A one-step submission process also increases the number of reviews received. On-site – Full customization of widgets, with all reviews labelled with a trust badge, the ability to ask buyers questions and includes in-depth information on each reviewer to help buyers qualify relevance. Retention – Focus on lifetime value of each customer through the use of post-purchase coupons, ability to comment on reviews and community Q&A. Marketing – Social integration allows you to automatically share your best reviews on Facebook and Twitter to increase their reach. Yotpo ads and email upsells leverage your reviews to bring quality traffic to your site. SEO – Increases your SEO visibility by showing your reviews and ratings on Google and offers the ability to display your reviews across Google Shopping and search with product listing ads. Website reputation rating tools are increasingly capturing feedback from users to rate the trustworthiness and reliability of websites. This means that website owners needs to monitor these tools to ensure they are not penalised by these service providers. Visitors have also become accustomed to major websites such as Amazon displaying product ratings and reviews on relevant pages. This has led to a huge increase in user generated content and an expectation that genuine sites automatically display ratings and reviews to assist users. This means that sites that fail to encourage customer ratings and reviews may be perceived to be less trustworthy. It also likely that conversion rates will not be as high on sites that fail to display customer ratings and reviews. We recommend Trustist Reviewer, but always check out other solutions to get comparative quotes. Thank you for reading my post. If you found it of interest please share this post by clicking on the social media icons below. Also see examples of social proof in my glossary of conversion marketing.